A native of San Antonio, TX, David was introduced to the Ocarina through the 1998 Nintendo video game, "The Legend of Zelda: Ocarina of Time". After receiving his first Ocarina back in 2000, he played as a hobby until 2007 when he began posting music videos on Youtube.com, quickly gaining a large following. He now has over 50 million video views and over 166,000 subscribers on Youtube. With a collection of nearly 200 ocarinas from the last 160 years, David has toured the country educating the public on the history and development of the instrument, as well as teaching thousands of people how to play the ocarina with his educational video series, "OcTalk!". 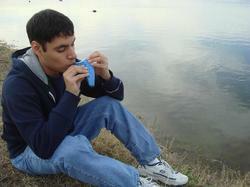 David initiated the first major US Ocarina Gathering in 2009, held in Seattle, WA, which was sponsored by Songbird Ocarinas and SMule Inc. He also represented the United States when he attended the 2011 and 2015 International Ocarina Festival in Budrio, Italy. Since 2012, David has partnered with JMP Productions and Nintendo of America to present a series of ocarina workshops in New York City as part of a promotion for the traveling concert tour, "The Legend of Zelda: Symphony of the Goddesses" and occasionally performs as an opening act for the concert performances. In 2013, David successfully raised over $23,000 via crowdfunding for his debut studio album, "Leave Luck to Heaven", with 10 of the tracks being original compositions. He toured the United States in 2014 to promote the album and is currently working on a second album due Fall of 2016.